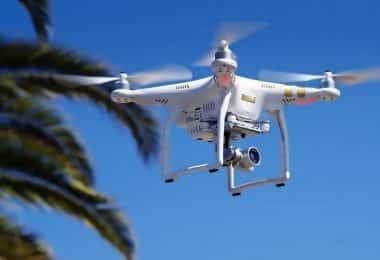 In today’s world, drones are by far one of the most popular hobbies out there simply because of the applications and the sheer demand for the photos and videos that they are able to capture. That being said, there are a lot of drones on the market, all of them with their own special features and their own advantages as well as disadvantages. One of these drones is the JXD 509G, a drone that at first glance might not look special, however, the moment it takes off things start to change a little. Make no mistake about it, this drone is designed and manufactured with a very clear purpose in mind – to help capture some of the greatest pictures and videos that you might think of capturing. The way in which it does that, as well as what the drone is actually capable of doing, are the things that really set this drone apart from all other drones on the market. Something very important to note here is the fact that the JXD 509G is one of the most agile and capable drones on the market. However it is not exactly the friendliest one when it comes to new pilots. 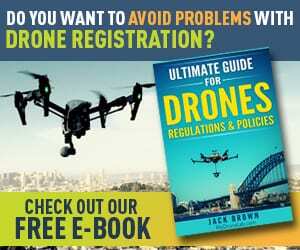 It can take quite a while for inexperienced pilots and beginners to become comfortable with this drone and learn how to really push it to its limits. Compared to other drones on the market, JXD 509G indeed comes with everything. The good people over at JXD have actually learned from the mistakes of other manufacturers and are properly shipping the drone out with the appropriate wrapping and the appropriate protection against damage and shipping problems. 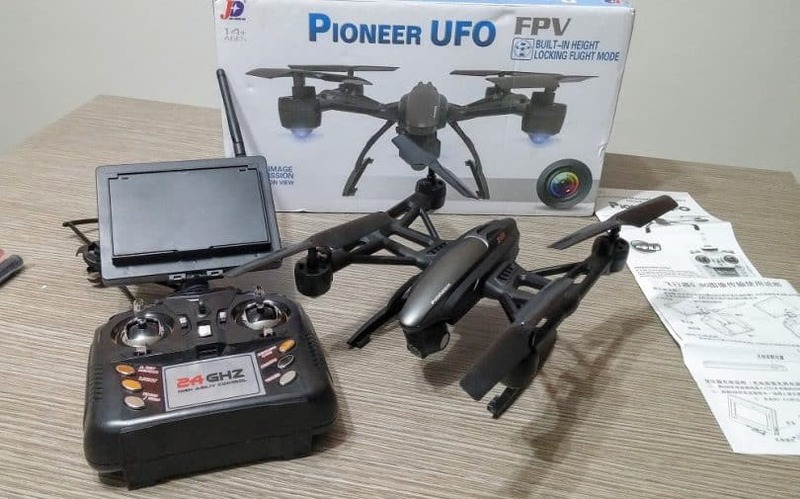 The very first thing that you will receive is a very hefty and bulky rectangular box that is jam-packed with Styrofoam and shock absorbing padding in order to prevent the drone from taking any damage during shipping. Depending on which version or which pack you choose you can opt for either a video monitor for your transmitter or a phone clip. You might also receive a complementary set of propellers, a complementary battery or both. The battery and the propellers themselves are not really that expensive, in fact, they are quite affordable, and it is normally advised to purchase 3 to 4 extra batteries and 3 to 4 sets of spare propeller blades to make sure you are set to fly for a rather long time. One last thing to note here is the fact that the propeller protection rings are important and a great asset to have. It will take a while for pilots to get used to this drone and the way in which it flies, which is why it is recommended that the rings should be mounted while the drone is being learned by the pilot and not immediately discarded. One of the major things that will attract your attention is the fact that JXD 509G has a rather weird elongated, and at the same time, sleek shape compared to the bulkier, more intimidating drones in its bracket. This is because of the fact that this drone was designed from the very beginning to work with the air around it and not against it. That being said, the drone has incredibly reduced drag and is capable of handling a lot of air flow coming at it from all directions while still maintaining a steady and balanced level of control. The propellers on the drone are placed rather oddly when compared to other drones in the same bracket and category. 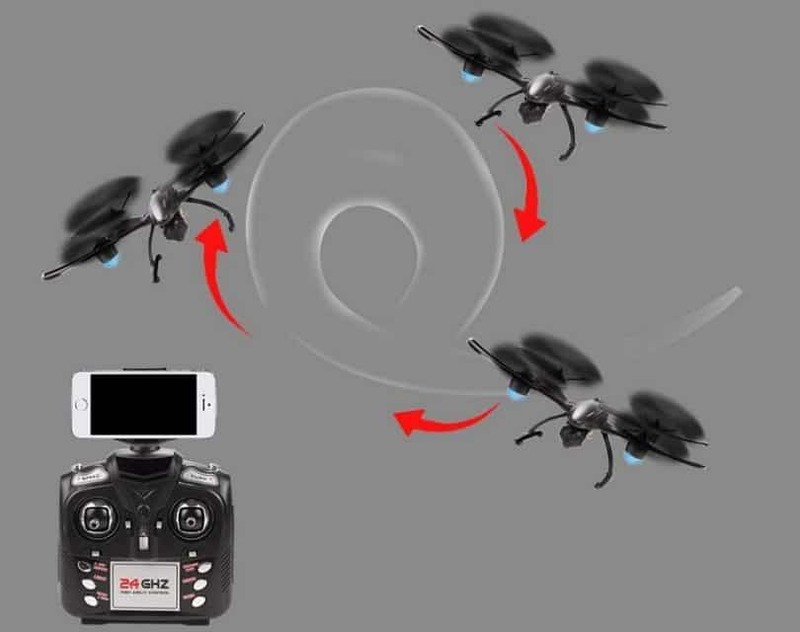 Most other drones tend to keep their propellers in a very symmetrical position, often times forming a perfect square when drawing a line between the centers of the propellers. 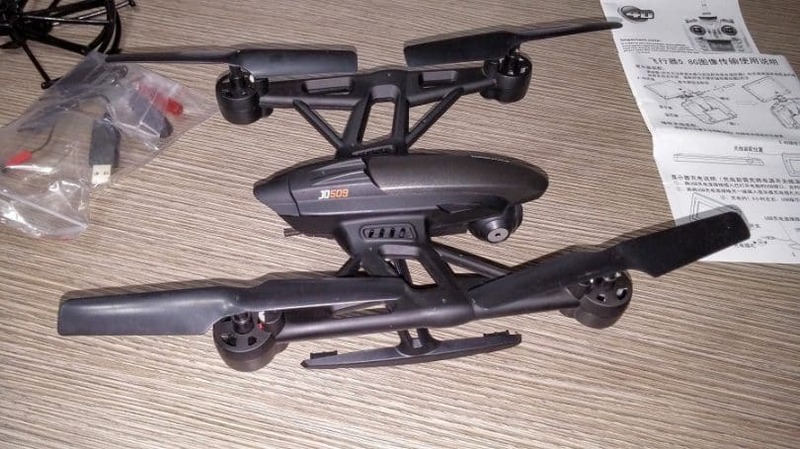 The JXD 509G switches things up again because the propellers are not placed in a symmetrical square configuration but rather a rectangular one, the propellers themselves being placed more towards the ends of the drone. The rather odd positioning of the propellers will feel quite strange at first, especially for pilots that are used to the more conventional drones. The drone in of itself will feel a lot slower and a lot harder to control as a result of this, which is to be expected. However, there will be next to no balance issues and no stability concerns. This is where the placement of the blades really shines because it offers the drone that extra bit of balance and that extra bit of stability. Another thing that is easily noticeable is the position of the camera itself. Unlike most other drones that have a more bulky body and a camera placed underneath, the JXD 509G has the camera placed at the very front of the drone, orientated and aligned in such a way that it offers the pilot the very POV of the drone itself. One thing to mention here when discussing the camera is the fact that the camera does not have a gimbaled mechanism, nor is it supported by the mounting bracket. This is a slight problem for people looking to get the perfect shots from more demanding angles or that are facing hectic flight conditions, however, it is actually perfect for people that are after fly-by shots and videos. The main body of the drone is designed to be as aerodynamic as possible, allowing the drone to move freely through the air more like a small plane than a helicopter, without having to worry about frontal drag or side winds. The propellers are surprisingly well balanced and sturdy enough to handle harsh flight conditions, however, because of the positioning of the propellers in the first place it is actually a little difficult to maneuver the drone in place, often times requiring the pilot to make special maneuvers in order to do so. When it comes to the durability of the aircraft, it tends to go both ways. The JXD 509G is more than capable of balanced flight during harsh weather conditions as far as drone standards go, but there is a lot of wear and tear being done to both the rotors and the main motor. Simply put, even though the drone is able to take a lot of punishment from harsh weather conditions, it was not designed with this aspect in mind, so there will be a fair bit of maintenance that needs to be done to it in order to maintain it properly. The body itself is well protected against collisions and minor crash landings and the propellers are well protected by the protective rings, provided that you have them mounted on to the drone beforehand. The actual part of the drone that is at risk is the camera. 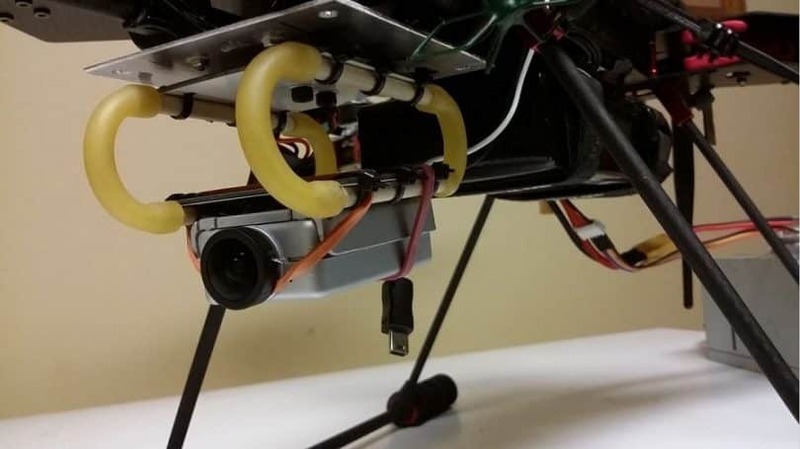 Even though it is mounted at the very front of the drone, it still hangs lower than the rest of the body and it can suffer some damage in the event of a crash landing or unforeseen obstacles coming its way. Overall the drone is rather solid and rather stable, provided that the pilot flying it has decent amounts of experience and practice with it. If, however, you lack piloting experience, then, we suggest that you also check out our article about drone piloting and how to control it properly. The camera itself is nothing to write home about. It is pretty much a simple 2Mp forward mounted camera that sits neatly at the very front of the JXD 509G. It does not have a gimbaled system, it does not have any in-flight editing or filtering options, however, it is perfectly calibrated to take mid-flight shots and film while zooming around. 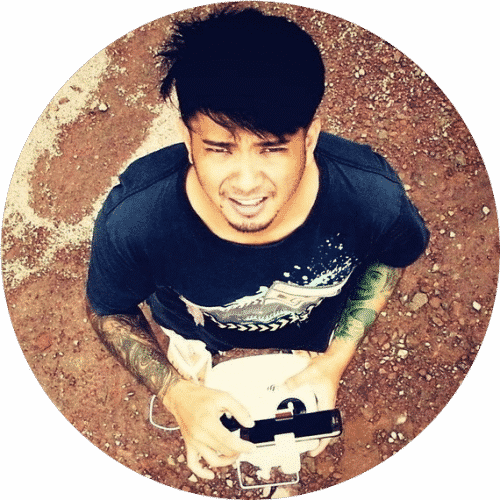 Obviously, the 2Mp resolution is enough for standard users and inexperienced to intermediate drone pilots, however for the pilots out there that want more clarity and a much higher resolution out of their drones, it is possible to modify and upgrade the actual camera by using different firmware and replacing the lens. However, these actions void the warranty of the drone. It is currently impossible to mount a different camera like a GoPro onto the JXD 509G without having to make heavy modifications to the drone. Another thing worth adding here is the fact that the battery does not really hold enough charge in order to accommodate a more demanding camera, to begin with, so it is advised to stick to the camera that the drone comes with. But, regardless of the camera you use on your drone, there are certain rules that need to be followed when filming from the air, and we have an article about drone photography rules that you can also check out. 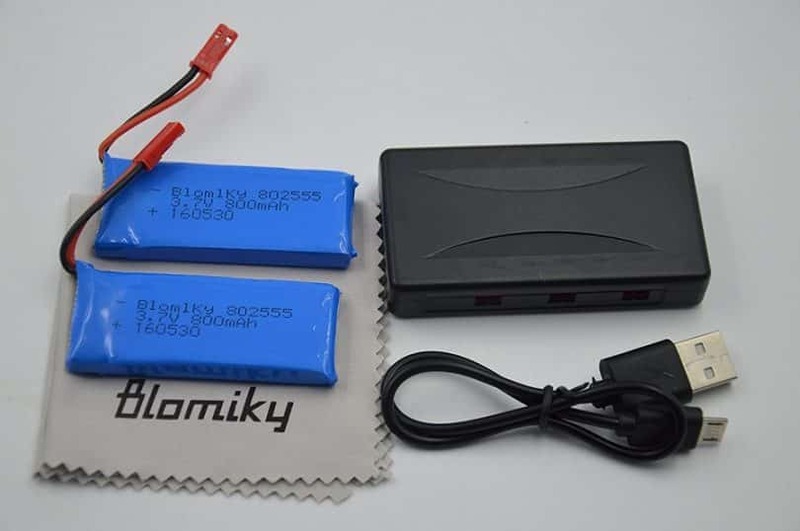 The battery is a 3.7V 600mAh Li-Po battery, which is not impressive, to begin with. It is able to provide the drone with 9-10 minutes of flight time and can be of great use to beginner pilots. However, it takes a while for the battery to be fully charged. Because of the rather low charge that these batteries are able to hold, combined with the fact that they are rather cheap, to begin with, it is often recommended that you purchase additional batteries in order to extend your time in the sky and get a lot more kicks out of your experience. Also, you can use some of the tricks to keep your drone in the air by following the advice from our article about the ways to extend your flight time. So far, there are no reliable battery expansion kits for the JXD 509G, and there is no way of fitting a bigger battery into the body of the drone. The controller is a 5.8 GHz controller with (depending on your choices and preferences) either a video monitor or a clip for your phone. The most popular choice is a video monitor because it is able to sync with the camera a lot better and provides the pilot with a sharper image as well as great feedback. The controller itself is a rather standard-looking and feeling controller, with the directional controls towards the top and the features towards the bottom. It can be a bit of a hassle for pilots with shorter than average thumb spans, however pinching is a viable control method with this controller so there should not be any problems. Something that needs to be noted about the controller is the fact that it needs to be properly calibrated before flying the JXD 509G. Make sure that everything is in order and that the controls are responsive before you get the drone in the air. Otherwise, you might end up with a rather unresponsive drone. One last thing to mention about the controller is the fact that it feels cheaply made for the vast majority of the time. It feels more like the remote control of a toy car than anything else. Still, this does not affect the performances of the craft nor the quality of the flight experience. Provided that the right calibration and the proper adjustments have been made, the flight performance of the JXD 509G is impeccable to say the least. 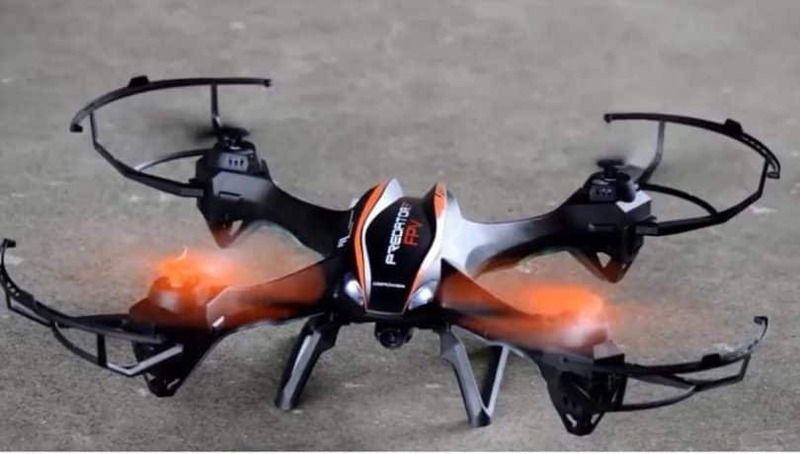 First and foremost, the 10 minutes of flight time that the battery offers you are a lot of fun. 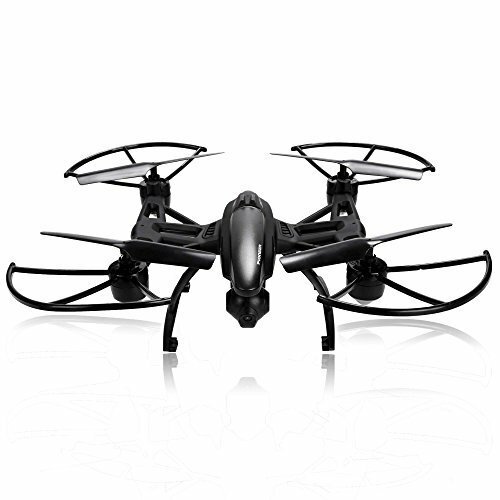 The drone is agile and able to execute the maneuvers that you command and is able to even perform tricks with ease. The drone has a very long signal range, up to 100 yards from the controller, and is able to execute a lot of maneuvers with ease within that distance. It comes with a lot of flight features, such as a one button return function and a wide flight mode which allows it to hover in the air while at a considerable distance from the ground. One very important thing to note here is the fact that the drone is not exactly great for inexperienced drone pilots. While it can be easy to maneuver and control, it takes a while to get used to it as well as all the systems that it manages to bring to the table. That being said, it is very easy to crash the drone if the pilot is not experienced enough. Considering the price of the drone, inexperienced pilots are better off learning how to fly different, cheaper, drones and eventually moving up to the 509G. One of the things that tend to drive people away from JXD 509G is the actual price tag. As of the day in which this review is written, the retail price of the JXD 509G is $95, which is not the most expensive drone on the market. 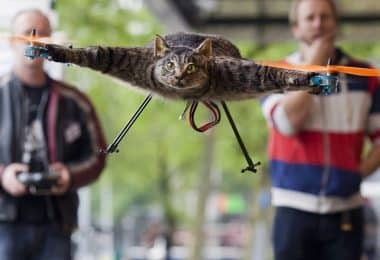 However, considering the features and options that this drone comes with, it is a bit too high right off the bat. 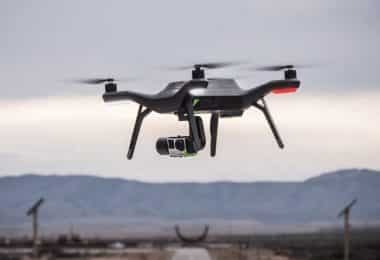 While the drone has a lot of features and is able to deliver the quality that it promises to deliver, the fact that the flight time is only 10 minutes at best, the camera has no gimbaled joint and that there is no actually accepted way of upgrade/replace the camera, makes this particular drone not deserve the initial asking price. JXD 509G is a great drone to have but it is just a bit overpriced. 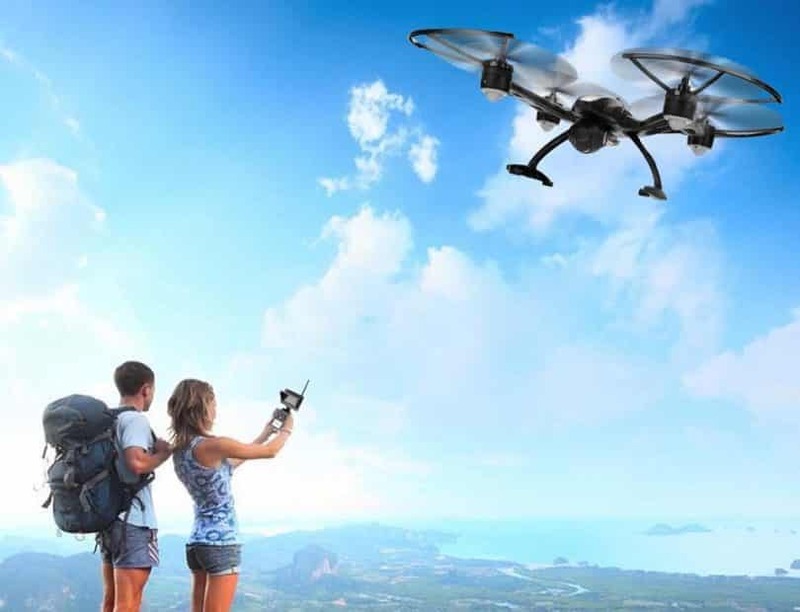 In regards to money back guarantees, the drone comes with the standard warranty that covers service costs and offers the pilot in question the option to replace the drone or refund it all together if within this time period there are fabrication faults that are discovered. 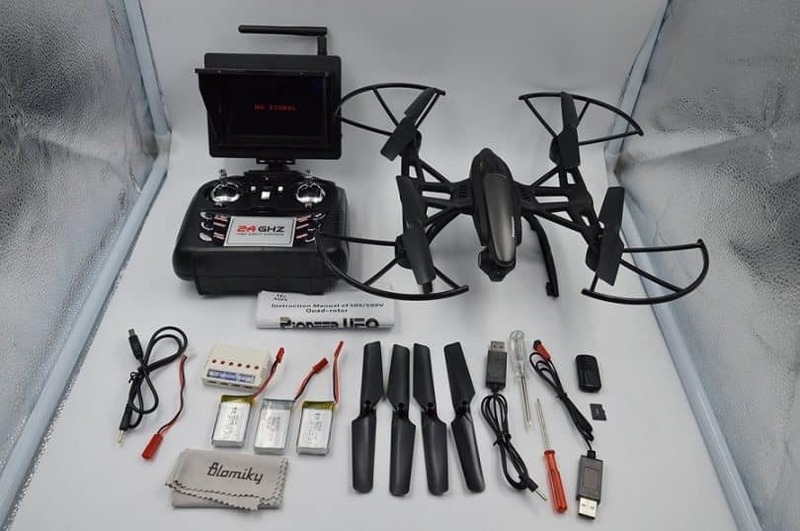 There are a couple of features that are unique to the JXD 509G, and the features in question are mostly related to the time that the drone spends in the air. First and foremost, it is probably the most agile camera drone on the market. Being able to execute 360 spins, barrel rolls, loops and various other agile maneuvers, while filming and at the very edge of the signal range, makes this little drone a nifty little flier. The second thing that needs to be mentioned here is the very design of the craft. Because of the rectangular placement of the propellers, the airflow over and around the body of the drone is a lot more uneven, providing the aircraft with quite a bit of lift and at the same time quite a bit of forward acceleration. This means that the drone does not have to tilt forward as much as other drones do, and it can accelerate a lot faster and a lot more evenly throughout its flight. These 2 features, even though completely separate at first glance, when combined, are more than enough to give the pilot a very satisfying experience. It also gives the camera the ability to capture footage and pictures without having to bank too much in order to compensate for the forward tilt. The Hubsan H502S is another one of the forward mounted camera drones on the market, just like the JXD 509G. However, this one comes with some twists. First and foremost, the H502S is a lot more aerodynamic, with improvements made for both lift and thrust, making it a lot more nimble and a lot more stable. Another interesting thing to note about this little drone is the fact that it is incredibly lightweight, making it easy to fly and a lot easier to control than other drones. 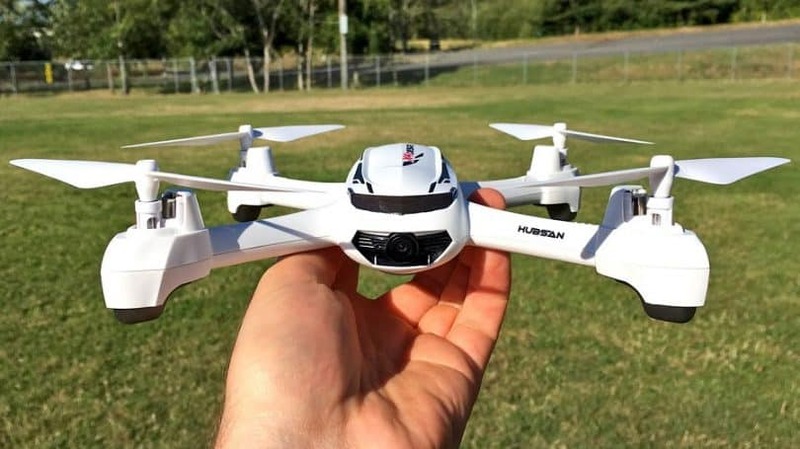 Overall, the Hubsan H502S FPV X4 Desire is a drone that is quite pleasant to fly and well equipped from a camera point of view. With a 720p camera and a flight time of 10-15 minutes, it may be a better choice for pilots that simply want to spend more time in the air and really focus their shots. This is a more intimidating contender in the forward mounted camera drones category. First off, it is a lot bigger and a lot louder than other drones from the same category, but it is able to deliver a lot more performance as well. With a lot of customization options, a solid modding community behind it and a lot of options for both controls, capture and flight systems, the U842 is a drone that is able to deliver a lot of performance for a lower price. The thing that needs to be mentioned here is the fact that this drone cannot deliver as much agility and as much nimbleness as the JXD 509G, and it tends to fall behind when it comes to speed. Yet another forward mounted camera drone, however this one tends to stand out from all points of view. First off it has a much lower profile and a much more attractive design than all the other drones in the same category. It is made out of dense yet lightweight plastic allowing the drone to have all the aerodynamic features that it needs and still keep a tight frame and a low profile. 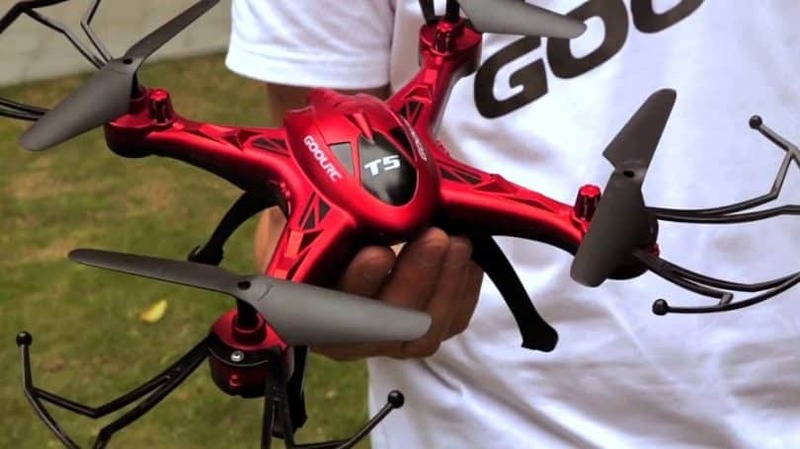 GoolRC T5G is able to deliver a lot of flight performance, especially when looking at the agility of the craft itself, and great footage with the forward mounted camera that it sports. Another great thing that this drone brings to the table is a video monitor that is mounted directly into the controller, making it a lot easier to keep track of and a lot harder to misplace the controller or the video monitor. What this drone is lacking, however, is actual raw power. It cannot fly as high and as far as all the other drones in this category, and the battery itself gives it a flight time of only around 10 minutes. However it is still a great thing to consider especially because of the very low price tag that it comes with. After listing its main characteristics now, let’s see some pros and cons of JXD 509G. In conclusion, if you are looking for a drone that is fun to fly, responsive and agile but still able to give you good performance when taking pictures or shooting videos. 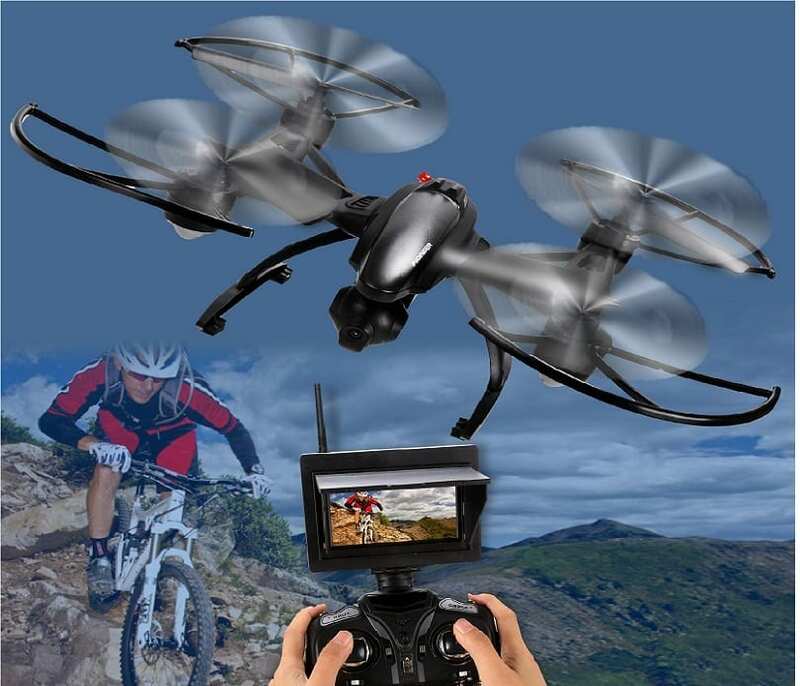 The JXD 509G is a nifty drone that can satisfy the needs of average drone pilots, offering them a lot of maneuverability, a lot of agility and an average flight time of around 10 minutes, depending on multiple factors. It does have great video and photo capabilities thanks to its 2Mp camera, but it also has some drawbacks which will, sooner or later, hinder creativity and overall freedom when it comes to photography and videography. Then the JXD 509G might be just the right pick for you. Large Drones for Sale: Is Bigger Better In This Case?